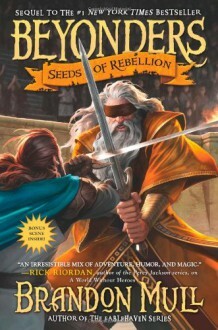 The second epic installment of Brandon Mull’s #1 New York Times bestselling fantasy series!After the cliffhanger ending of A World Without Heroes, Jason is back in the world he’s always known—yet for all his efforts to get home, he finds himself itching to return to Lyrian. Jason knows that the shocking truth he learned from Maldor is precious information that all of his friends in Lyrian, including Rachel, need if they have any hope of surviving and defeating the evil emperor.Meanwhile, Rachel and the others have discovered new enemies—as well as new abilities that could turn the tide of the entire quest. And as soon as Jason succeeds in crossing over to Lyrian, he’s in more danger than ever. Once the group reunites, they strive to convince their most-needed ally to join the war and form a rebellion strong enough to triumph over Maldor. At the center of it all, Jason and Rachel realize what roles they’re meant to play—and the answers are as surprising as they are gripping. It was about the same as the first book. Could have used editing. Boring in sections. We haven't really gotten anywhere. The characters wander and they talk and they fight and it's not all that engaging. I liked the first one slightly better. I will be finishing the series. I liked the book a lot, but Brandon Mull is a jerk to end another book with another cliff hanger. And a whole year until the next one comes out.